It’s bad enough that we have to worry about distracted drivers looking down at their phones, but new research has found an even more vexing trend. Drivers can look straight at cyclists and still not “see” them, leading to dangerous or deadly encounters on the roads. A recent study out of Australian National University asked 56 adults to examine a series of photographs depicting common roadway scenarios from the driver’s point of view. Some photos were manipulated to include either a motorcycle or a taxi. Overall, the volunteers were more than twice as likely to notice the appearance of the taxi as they were to spot the motorcycle. In fact, a full 65 percent indicated that they didn't see the motorcycle at all. This phenomenon - a person's failure to notice an unexpected object in plain sight - is known as “inattentional blindness.” It’s the reason why a driver might look right at you, but cut you off anyway. Their eyes see you and your bike, but they don’t register your presence (as they would if you were in a car). And, sometimes, they hit you. That also has a name: looked-but-failed-to-see (LBFTS) crashes. When we are driving, there is a huge amount of sensory information that our brain must deal with. We can’t attend to everything because this would consume enormous cognitive resources and take too much time. Our brain has to decide what information is most important. The frequency of LBFTS crashes suggests to us a connection with how the brain filters out information. Though the study focused on motorcycles, it doesn’t take a giant leap of logic to discern how well cyclists would fare in the same scenarios. The issue might be even worse for bicycles that operate in traffic differently from cars or motorcycles. We tend to see what we're looking for, and we often miss unexpected things, especially when they differ from the focus of our attention. 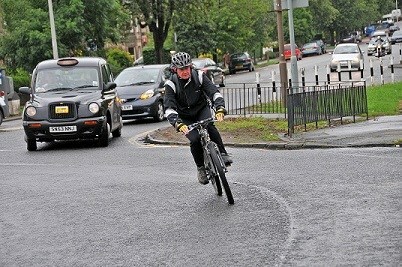 So, if drivers are always looking for cars and bicycles are rare, they can look right at the cyclist and not see them. The study concluded that more driver awareness programmes should instruct on how to watch out for non-car road users. In the meantime, assume drivers won’t see you and ride defensively. Employing some of the same strategies as motorcycles, such as daytime running lights, may help cyclists catch the attention of drivers.